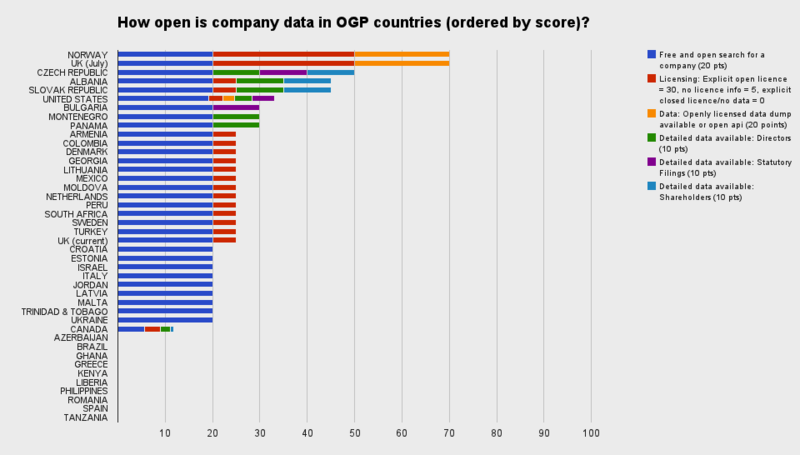 A couple of months ago, OpenCorporates published our report on access to company data in Open Government Partnership countries, which was pretty dire, with the countries scoring an average of just 21 out of 100 points. Well, today, Norway has boosted that average a bit, by becoming the first Open Government Partnership country to publish its company register as data, and so instantly went from 8th to 1st place on our Access to Company Data scoreboard (the UK has committed to publishing its register as open data in July, but has not yet done so. Update: it has now done so too). We’ve been talking with the Norwegian open data people for quite a while now, and it’s great to see that with their new launch of their open data api, they’ve added the basic company data to it (an API enables two different computers to talk to each other, compared with a scraper, which looks at a web page designed for humans and tries to extract data from it). That means we can retire the OpenCorporates scraper for Norway (which is good, as scrapers are an intensive and inefficient way of getting the data), and use the API to ensure we’re bang up to date, like the UK and New Zealand, where we also have API access. At the moment, the information returned by the API is pretty basic, with none of the detail that you need to get a full picture of the company (e.g. directors, filings, shareholders), but hopefully this will eventually be made available, putting Norway further in the lead. Meanwhile, the Belgian Ministry of Finance has announced (English summary) that it is also going to open up its company register as open data too. In the Belgian case, this actually requires a change in the law. More details are expected in the next few weeks. In both cases this shows not just a commitment by Norway and Belgium to open data, but an understanding that the company registers are critical public registers, essential to the understanding and supervision of companies, which after all are artificial entities given legal personality by the state separate from the owners and managers for the good of society. Let’s hope that some of the bigger European countries follow Norway and Belgium’s important first step in this area. Do you have a source for your statement that the UK has committed to publish its company register as open data? This is the same information that Companies House made available to the public for free previously, except that it can now be downloaded in bulk. I have not heard of any plans for open data publication of the company register itself, i.e. information on company directors and company accounts. This is what we meant – we weren’t aware they’d started publishing it yet; it was a commitment made in the Autumn Statement. Will amend. Like Norway, not all the detailed data is there, but it’s a start. This is something I’ve been lobbying towards for years, and I’m thrilled it finally happened. Congratulations Chris for being mentioned positively by the Norwegian government and getting your due credit. This won’t sate our thirst for public data – if anything it simply whets our apetites for more!! MOAR DATA! !